The demands of today's global marketplace, technology, and product complexity have created a new surge of interest in teams and teamwork. Teams enable the intelligence and creativity of many to be used to solve a complex problem. Merely assembling a group of highly competent individuals does not, however, create an effective team. The Team Essentials Model highlights the fundamental elements necessary to begin creating a high-performing team. Any team effort is doomed from the beginning if it's not receiving internal support from management. For example, has management provided the team with the essential resources it needs to get the job done? Are team members meeting in a desirable location, and do they have the necessary tools to complete their tasks (e.g. research materials, computers, networks, high-speed Internet connection, laboratories, groupware, electronic bulletin boards, etc.)? Does senior management ask for regular briefings on the team's progress? Do they deal with the data they receive in a way that supports the team's efforts? This level of support speaks loudly to team members--boosting morale and assuring all members that senior management notices and appreciates their efforts toward achieving the corporate strategy. Clear goals provide structure and direction for each individual member of the team. They provide a vision toward which each team member, and the team as a whole, can strive. Clear goals also create the context in which team members can make their day-to-day decisions. This is especially important in cross-functional teams. With a single-function team, the team leader is clearly the boss, but with a cross-functional team, the members are in a matrixed organization. As a result, they have to answer to the team leader and their functional boss. The more that team members understand about team goals, priorities, and the direction of the organization, the better they'll be able to work on behalf of the team when they go back to their functions. For a team to be effective, clear goals need to be established and agreed upon from the very beginning. Team involvement in goal setting will increase each member's buy-in and commitment. This will be important when times get difficult and hard trade-offs need to be made. In short, the clearer the goals, the more effective the team can be. Also, the team may want to have an agreement regarding what specific communication tools and forums will be used (electronic bulletin boards, email, face-to-face, voice-mail, sub-group meetings, etc.). While everybody has preferences, a clear agreement must be made about which of these the team will use and for what purpose. For example, a team may decide to use email for all communication saving voice-mail only for urgent matters. Agreements should be as specific as possible. For example, agreeing that email will be responded to in a "timely fashion" may create a problem. Some team members may define "timely fashion" as several days, while others may think it means before the business day ends, or two hours after the meeting ends, or "when I have the time." The actual creation of agreements can serve as a team-building process itself as the team will experience working together, communicating, and making decisions. This experience can serve as a model for how the team can work together in the future. 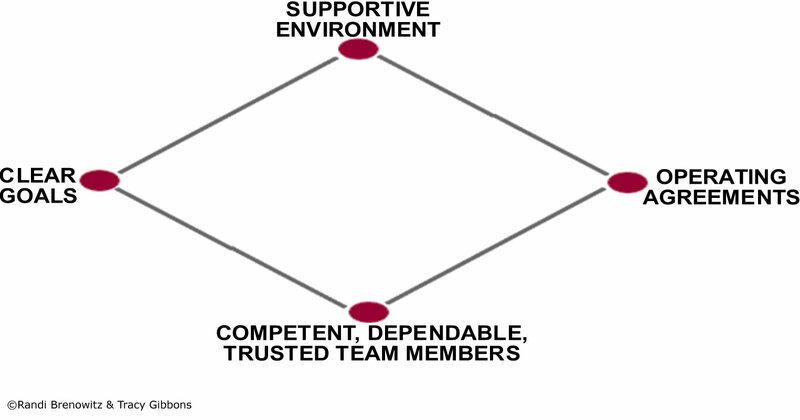 Perhaps the hardest part of the model to implement is building the competence, dependability, and trustworthiness of team members. Frequently, teams do not select their own members, but have to work with those whom management has pre-selected. If team members are not competent in their field of expertise, the team must ensure proper training for them and set goals and expectations accordingly. This means that team members must be honest about their capabilities from the start-something many are loath to do in today's highly competitive work environments. If the team explicitly states their desire to help, not punish, those in need of additional training or time, this will help alleviate the fear of exposure. Trust and dependability are defined here as knowing that your team members will complete their deliverables, that they will come through as promised, that they can be trusted with confidential information, and, most importantly, that they will keep the team agreements over time and even when that is hard to do. Any team member who breaks the agreement must understand that her or she is breaking the trust. Conversely, when team agreements are kept over time, they build trust between each team member and trust in the team process. Early attention to each element of the model and a decision about its relevance for your team is worth the time it takes. It will ensure that all team members are part of establishing the goals and strategies of the team and will put all of their efforts into meeting their deliverables. The model works equally well with single function, cross-functional, and virtual teams in any industry. Although the process needs to be adapted for each specific team, the elements in the model remain constant and are the foundation upon which any organization can build strong, high-performance teams. © The Team Essentials Model is copyright Randi Brenowitz & Tracy Gibbons. All rights reserved. To learn more about the Team Essentials Model and how to implement it in your organization, contact Randi Brenowitz at randi@brenowitzconsulting.com or 650-843-1611. To subscribe to Tools for Teams, Randis bi-monthly electronic newsletter, email newsletter@brenowitzconsulting.com.